June 20, 2015 – 9 a.m.
Saturday, June 20 -- 1 p.m.
Eleonora Mendonca had three consecutive wins from 1976-1978. She set the course record in 1977 and again in 1978. She and Hall of Famer Chris Maisto are the only women to have set course records multiple times. She recalls “I could not pass the opportunity to do a different type of race – only one hill. I could not forget the incredible view as I approached the summit...The beauty carried me on”. She was inducted into the Cambridge Sports Union Hall of Fame in 2000. The CSU website notes “Ellie joined Cambridge Sports Union in 1974 and had an immediate impact on the women’s running scene in greater Boston by being a top finisher in road, track and cross-country races”. Her biggest accomplishment was to qualify (for Brazil) at the Los Angles Olympic Games where she ran in the first women’s marathon. Eleonora is retired and currently living on Cape Cod. Eric Morse is possibly the most prolific runner to not have an overall win at Mt Washington. He has the Vermont state record for this race with his 1:01:09 from 1999. He is tied for the third most top 10 finishes with fourteen and is also tied for fourth with ten top five finishes. He ranks 14th in all-time earnings at Mt Washington taking home $4,200. 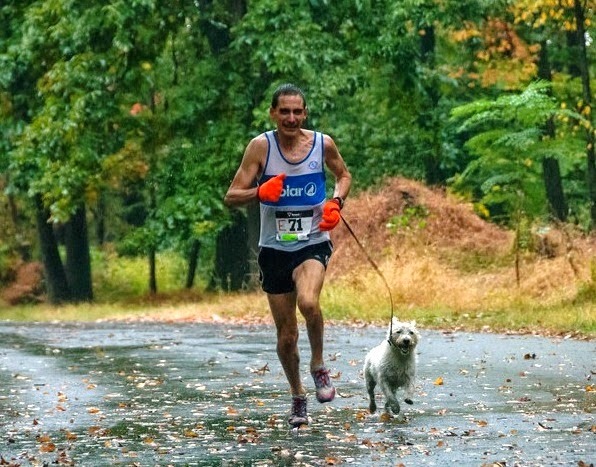 He scored on course record setting teams (Central Mass Striders) an amazing nine times, setting course records five times on the open squad and four times on the masters. He has finished the race sixteen times, including three times as runner-up. Eric was inducted into athletic Hall of Fame at Harwood High School (Moretown, VT) in 2010 as “one of the most successful athletes in Harwood cross-country and track-and-field history. As a junior, he won four Vermont state championships...as a senior, Eric won two state championships… (and) was a member of the first hockey team at Harwood”. His most memorable moment at Mt Washington was the “halfway race” of 2002 where he finished in second place, 10 seconds out of the win. 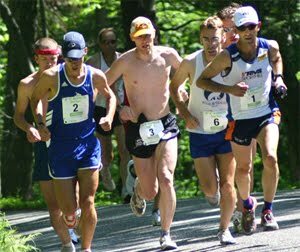 His many accomplishments outside of Mt Washington include being a 7-time member of the USA Mountain running team. He has quite a range of ability from a sub-4 minute mile to a 1:03 half-marathon. Eric is a graphic designer residing in Berlin, VT. In recent years he has excelled at racing with his West Highland Terrier “Murdoch”. 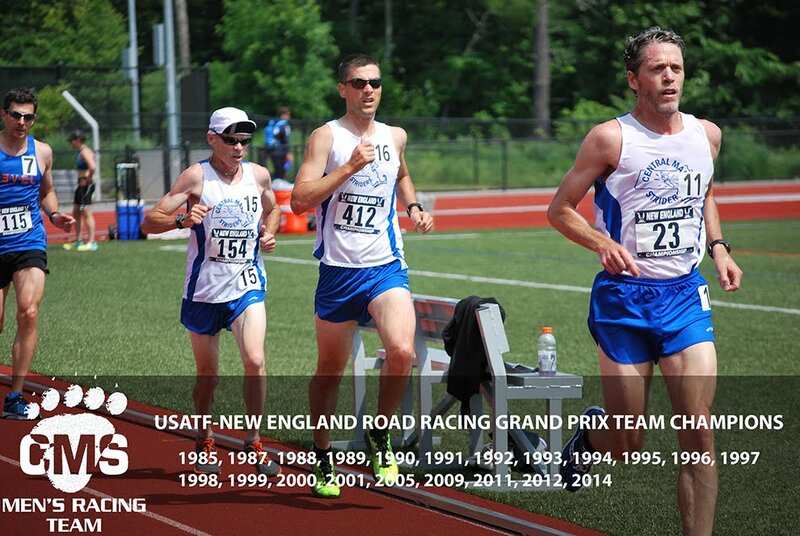 They have won nearly every race they’ve entered and can boast personal bests of 4:59 for the mile and 16:44 for 5km. Peter Watson - Peter, who passed away in 2012, ran the race 23 times from 1988-2011. He was the supreme organizer of Team Gloucester (TG), which annually accounts for an impressive number of runners in the field. He created the Mt. Washington Practice Run in Rockport, where he lived, and he organized it year after year. He publicized the race every way possible, from the newspapers he published to the word-of-mouth network that extended from him to thousands of people in many directions, but especially around Cape Ann, Mass. He dedicated large amounts of time and energy to promoting the race to all. He inspired, encouraged and led Team Gloucester to form as an official club. Each year he would email every runner he knew when the lottery would open. To get more runners past the lottery he offered to provide volunteers. Peter always organized and planned who would volunteer and supervised to make sure it was done well. He kept detailed records of each TG member’s races up the Mountain and compared times to previous year. He cajoled runners into competing on behalf of TG and generally orchestrated everything they did relative to the Mountain race. He is the reason for the strong TG women’s presence at the mountain to this day. Sam Wood and Dan Vassallo won respective 5K road races over the weekend while Jim Johnson cleaned house for a 5 mile race in Portsmouth. Dan Verrington took home the top senior spot. 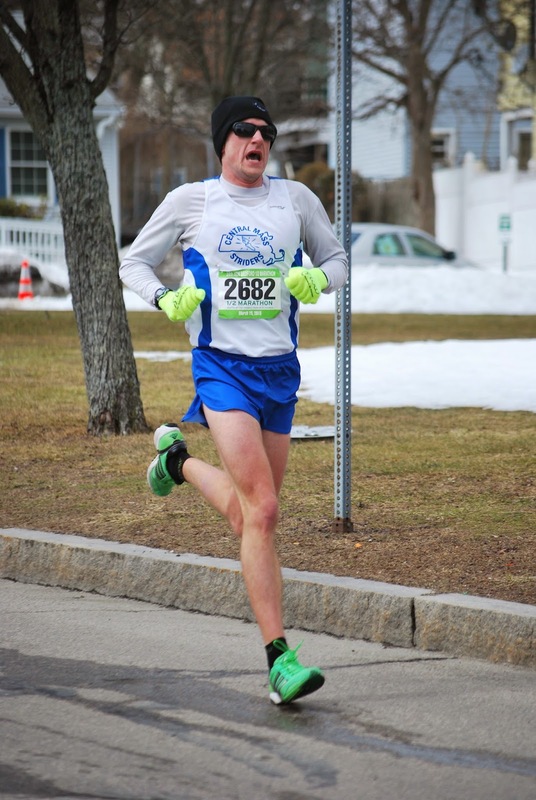 The Central Mass Striders embarked to New Bedford, Whaling Capital of the World, to compete in the USATF New England Half Marathon Championship. Dry pavement, a northerly breeze, and temperatures in the low 40’s greeted the field for the 11:00 start. The open and masters teams (40+) finished 3rd overall among the team results. There were 26 open teams and 15 master’s teams respectively. The senior team (50+) placed 6th out of 10 teams. Dan Vassallo led the CMS open team with a 9th overall placing and 4th in the USATF age group. Joe Shairs paced the CMS masters team. He placed 3rd in the USATF age group. Dan Verrington was the top CMS Senior. 3. GREEN MOUNTAIN ATHLETIC ASSOC. 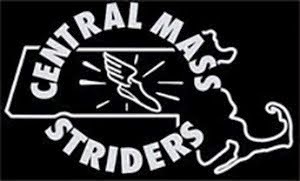 Several Central Mass Striders found the winning ways. Jim Johnson took a pair of recent wins on the snowshoes in southern NH. Scott Leslie went out easy and ripped the 2nd half of the Stu’s 30K course taking the win with an honest 5:45 pace per mile. Arthur Besse took the top masters position. Lastly, two DV’s toured Bradford with one winning overall and the other winning his age group.